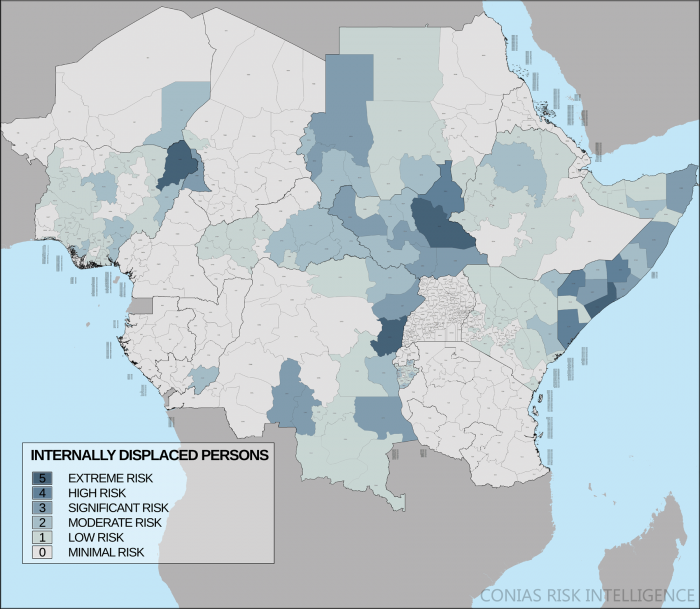 Early detection of imminent humanitarian crises is also possible: The CONIAS Conflict Risk Trend outlines the anticipated risk of a subnational unit, is monthly updated, and its scope covers the upcoming months. Thus, reliable estimates about anticipated conflict consequences for the civil population can be provided on a regional level. Our data is provided via GIS-service or as data container solution (.csv, .xlsx, etc.). Of course, we are open to your individual requests and we will adjust our products to your ideas and needs, if necessary. Burnt down houses, looting of cattle, contaminated water, or destroyed harvests. All these conflict consequences make life in regions of crisis substantially more difficult for the civil population. 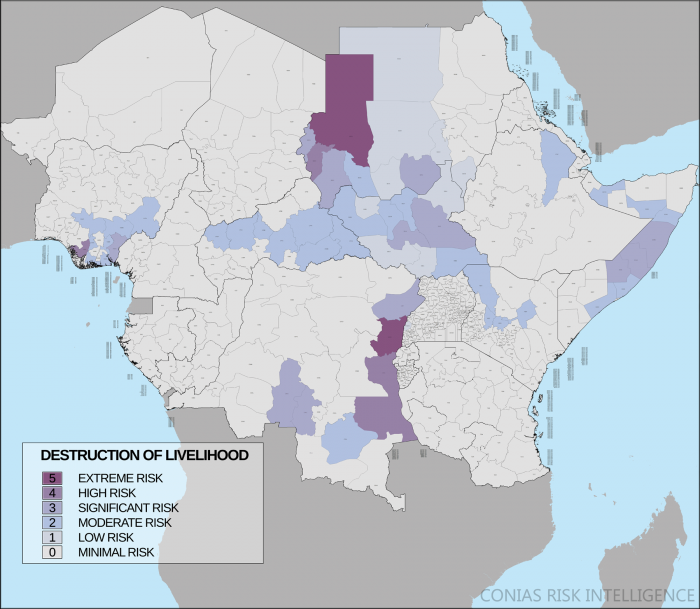 The following map provides an overview of the affected regions in parts of Sub-Saharan Africa. The risk assessment is based upon CONIAS conflict data for the months January to July 2017. 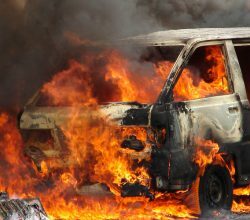 Many conflicts do not only cause civilian collateral damage but are rather characterized by the intentional and targeted killing of civilians. Especially inter-ethnic violence or islamist terror can be grouped in this category and often result in a high civilian death toll. The following map provides an overview of the affected regions in parts of Sub-Saharan Africa. The risk assessment is based upon CONIAS conflict data for the months January to July 2017. In many cases, the outbreak of violence leads to internal displacement of the local population. The following map provides an overview of the regions people are fleeing from because of ongoing violent conflicts. The risk assessment is based upon CONIAS conflict data for the months January to July 2017. 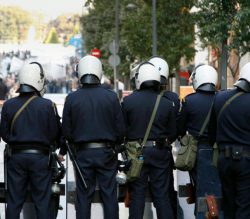 Systematic and widespread occurrences of violence in particular cause people to leave their home country. The following map provides an overview of the regions where people are fleeing their country of origin because of ongoing violent conflicts. The risk assessment is based upon CONIAS conflict data for the months January to July 2017. Data for the Democratic Republic of Congo will serve as an example for the CONIAS methodology of early humanitarian crises detection. The following map shows the subnational units and their respective risk ratings with regard to the targeted killing of civilians. The risk assessment is based upon CONIAS conflict data for the months January to July 2017. In addition, on the right side, the regional Current and Trend Risk Values for the prevailing conflicts are displayed. In combination, these indicators allow for risk prediction with regard to the endangerment of the civil population. The prognosis is furthermore elucidated by the arrows on the far right. 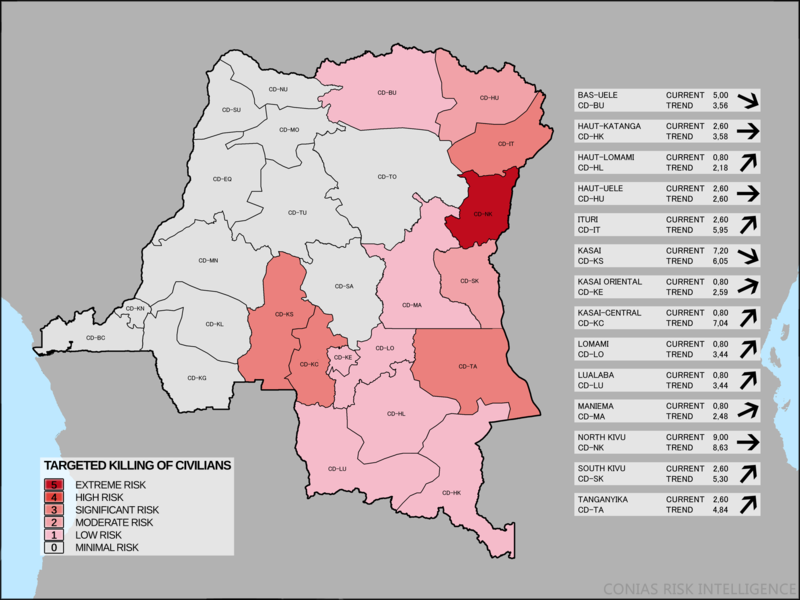 A threat to the civil population and therefore a rising death toll in the upcoming months is indicated by a high Trend value in a region with a significant to extreme risk of targeted killing of civilians, as in the example the case with the region Kasai-Central. 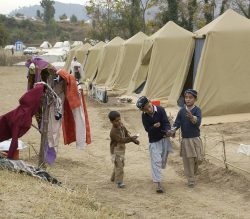 The early detection of humanitarian crises is thus feasible with the CONIAS-methodology.